The most common complaint people have when looking to book a Maldives holiday is that there are just so many resorts. Where to start? Hotel websites all claim to be the best resort, travel agents might want to push you towards certain hotels with whom they have better relationships with, and even supposedly objective review sites can be biased. Understandably therefore, after hours, days or even months trawling the web, most people end up choosing a resort recommended by a friend or a resort that fares favourably on a deal online. In order to help you get the most out of your Maldives holiday I have put together my list of the top ten resorts in the Maldives today. As people often have strict parametres of what they are looking for, to make it easy I have awarded each resort a ‘Best for’ award before revealing my absolute favourite hotel. Happy reading and, hopefully before too long, happy travelling! Part of Christina Ong’s luxury hotel brand, COMO, Cocoa Island is consistently rated one of the best resorts in the Maldives. Although favoured by the rich and famous, Cocoa Island attracts a different calibre than the majority of glitzy Maldivian resorts; people choose to stay at Cocoa Island because of its laid back, care free vibe and its indifference to celebrity. Much like at Amanpuri, at Cocoa Island you’ll find some of the world’s movers and shakers, but without the paparazzi, fame hunters and footballer’s wives that normally accompany them. Interiors are what you would expect from COMO: crisp white linen, Nantucket-esque white wooden pannelling, dark teaks, tasteful throws, pillows and petits objets from around the world. Another ‘best for’ award for Cocoa Island would have to be ‘best for spa lovers’. Make sure to experience the brand’s first-class COMO Shambhala Retreat; people travel far and wide just to experience their signature treatments and exquisite COMO Shambhala products. 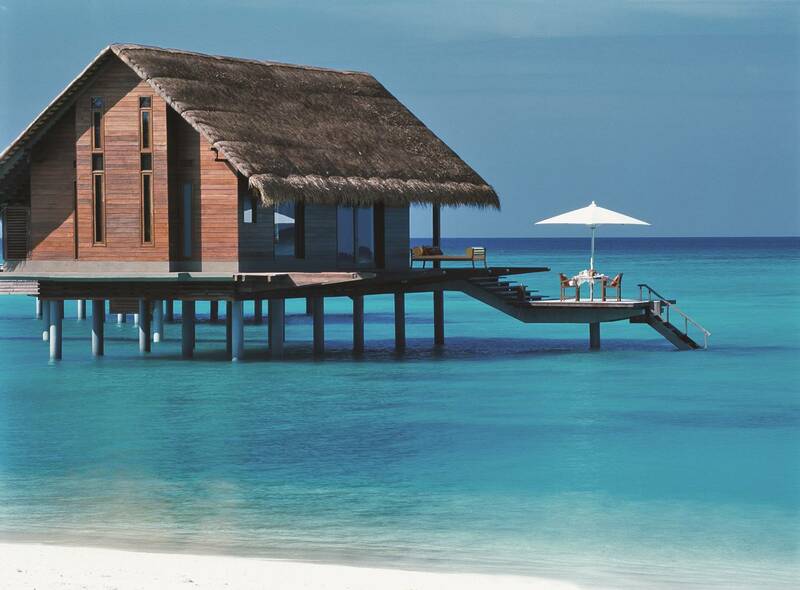 Much to most people’s surprise, you don’t have to be a millionaire to visit the Maldives. Plenty of companies now offer incredibly competitive ‘fly and flop’ package deals that have opened up the islands to more normal folk. However, the trick is knowing which budget conscious resorts are good value, rather than just budget friendly. 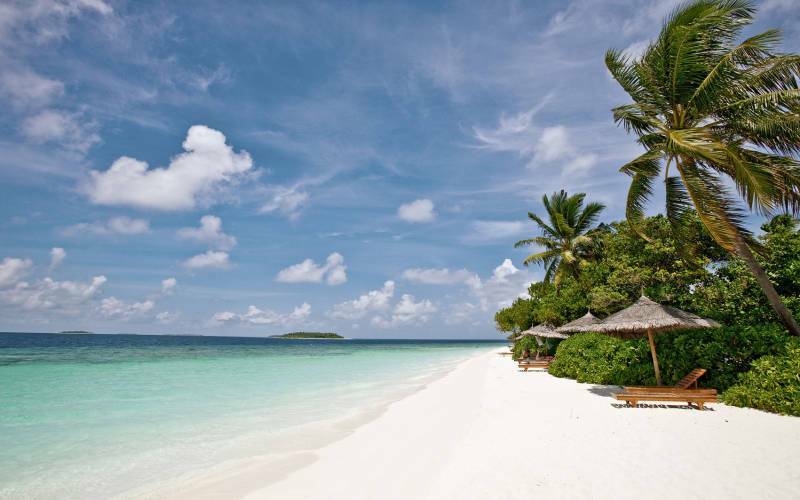 A well kept secret in the world of Maldives resorts, Reethi Beach Resort is about as charming as they come. Tiny but perfectly formed, Reethi comes with picture-perfect white sand beaches, transparent turquoise waters and swaying coconut palms. To really make the most of your budget stay in a Reethi Villa and go for one of their all-inclusive packages; these normally include all meals, alcoholic drinks, afternoon tea, certain activities and one diving lesson a day. Soneva Fushi is one of those resorts that manages to successfully pull off pleasing a lot of different people at the same time. Attracting a range of guests from honeymoon couples and sun-loving retirees to groups of friends, in my opinion Soneva Fushi excels most as family destination. A naturally wooded island, with lots of Tarzan-esque tropical jungle to explore, Soneva Fushi hosts an incredible range of children’s activities. Take a Robinson Crusoe picnic on another island, benefit from an al fresco viewing of your favourite film at the resort’s open air cinema or attend a kids-friendly cookery class. If you book one of the family packages you’ll also benefit from three hours of complimentary child-minding. More than just activities though, the resort also plays host to a family-friendly range of pool villas, meaning that children can play to their heart’s content while you snooze (with one eye open) in the hammock. The epitome of a five star luxury retreat in the Maldives, Reethi Rah is part of the Kerzner-owned One & Only brand, and was designed by one of my heroes, Jean-Michel Gathy. The first choice of those that love glamour and glitz, Reethi Rah is full of beautiful people; the place for you if your idea of a holiday includes looking catwalk-ready without a hair out of place, even just for a swim in the sea. However, not for nothing does Reethi Rah attract supermodels, starlets and sport stars. A seemingly endless crescent moon of beach, palm-shaded swimming pools with overhanging hammocks, infinity beach-facing lap pools, indulgent ESPA spa, four restaurants (including Japanese), expansive beachfront villas with private pools and mouth-wateringly perfect over-water villas (with a private sun deck) all combine to create something not short of Maldives perfection. 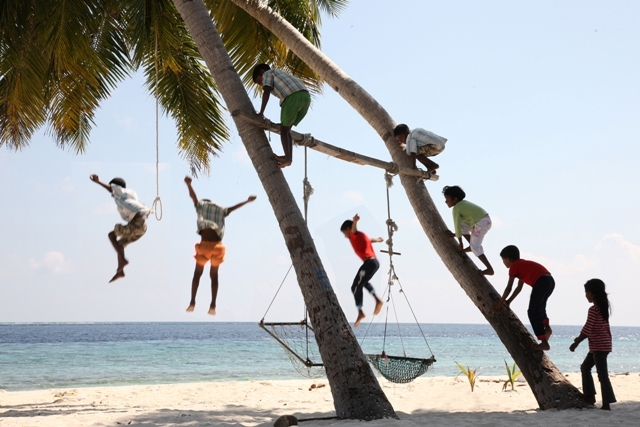 Perhaps surprisingly, Reethi Rah is another great option for families. With dedicated kid’s pools, water slides and sushi-making classes, little ones will love it here. Slightly out of the way in Laamu Atol, Six Senses Laamu is a fun-loving resort that exudes cool, calm and class. Although part of the exclusive Six Senses brand, this laid-back Maldivian retreat is the exact opposite of attention-seeking glamour and the airs and graces of some five star resorts. Unlike the standard setting of honeymoon couples retreating to their over-water villas after a long day at the beach, Six Senses Laamu has been designed to encourage socializing, whether you come as a group of friends or not. By day the The Chill Bar is an inviting place to spend an afternoon; spread over several levels, this over-water bar includes white cushioned alcoves, a tinkering piano and direct access steps down to the lagoon. After dinner at Longitude restaurant, continue the party on a large over sea deck complete with cushioned areas and atmospheric glowing lamps. Another great resort for social butterflies looking to party is the recently opened Niyama. Boasting its own underwater nightclub, Subsix, with visiting artists such as Tinie Tempah, ravers who appreciate the finer things in life will adore it. 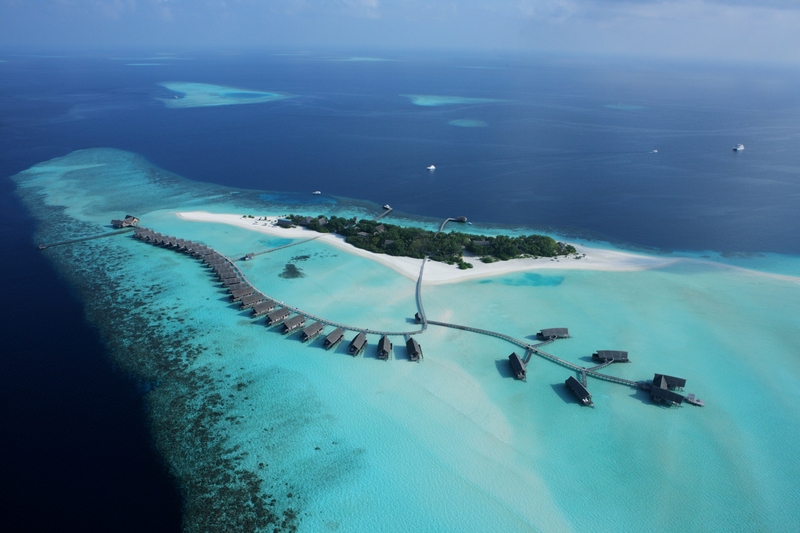 A small and exclusive resort, Baros was the third resort to open in the Maldives, in 1973. Today, as when it opened, Baros is well known for its top-notch service, warm Maldivian hospitality and its peaceful and relaxed setting. Perfect for honeymooners or just couples looking for some one-to-one, Baros doesn’t allow motorised water sports, noisy vehicles or children under 8, and has no child-friendly facilities or accommodation options in order to encourage the resort to remain adult-only. The result is an island of tranquility with an incredibly smart crowd; snorkel on the house reef, sunbathe uninterrupted on the deck of your water villa, dine facing out to sea at the Lighthouse restaurant and make the most of the superb spa – all of your desert island fantasies will become reality while marooned on this slice of heaven. Although ‘Park Hyatt’ usually scares off lovers of luxury, don’t make the mistake of lumping this Hyatt in with the rest. 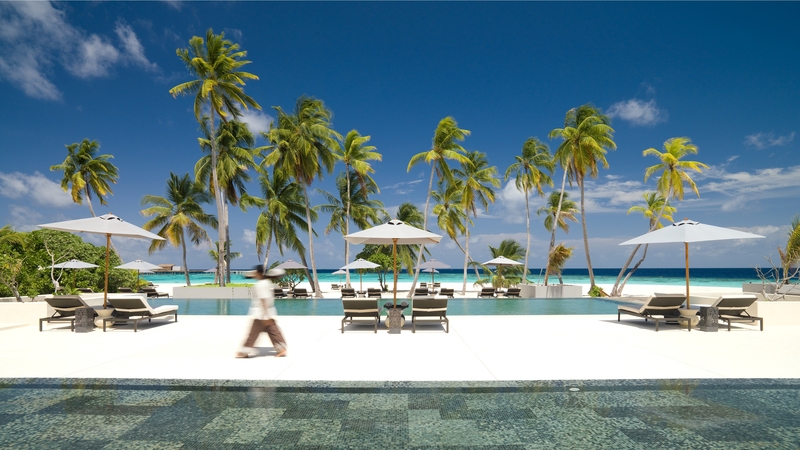 Formally Alila Villas Hadahaa, the Park Hyatt Hadahaa is an excellent resort. A small property, the Park Hyatt has only 50 villas, meaning the overall feel is small, stylish and secluded. However, the thing that makes this resort stand out from the crowd is its sensational swimming pool. Combining all the things that people really travel to the Maldives for, at Hadahaa the view from your minimalist poolside lounger is all sun, sea, sand and sky. Bar a few palm trees swaying in the wind, the view is an uninterrupted 180 of deep blues, crystal turquoise and white sand. Without having to do all the whole sticky salt and sand thing, an afternoon by the pool at this Maldivian paradise will tick every box for those who like their swimming fish-free. If you think you know over-water villas, then look again – at the Taj Exotica they are simply mind-boggling. In addition to their size, one of the best things about the villas at the Taj Exotica, the Maldives branch of glamorous TATA-run hotel chain, is the décor. Interiors feel fresh and modern, while at the same time bypassing the tired clichés of too much wood panelling and unconvincing ‘stylish’ furniture that just ends up trying too hard. Crisps whites, Maldives sea-blues and large windows open to the elements combine to make you feel at home, while living in the lap of luxury. The Taj however is fantastic for more reasons than just this; one of the closest resorts to the Maldivian capital, Male, the Taj benefits from short speedboat transfers (for when you’ve come off the plane and are just gagging to get into that water) and some of the finest food (and the freshest) of all the resorts in the Maldives. Another fantastic family-friendly option, the Hilton Conrad Rengali is much more than your average Hilton; in fact, those who come back from a stay at Conrad Rengali often return with acute post-holiday blues symptoms; defeatism, rose-tinted nostalgia and resigned acceptance that they’ll never have a holiday quite like it ever again. 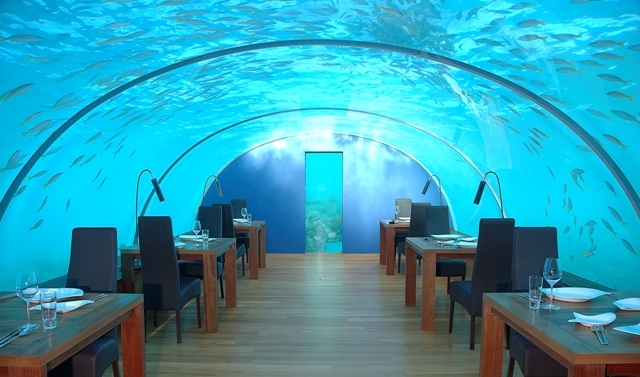 One of the most novel aspects of the resort is its ‘underwater’ restaurant. Channelling a 3,000 leagues under the sea vibe, with a large splash of glamour, a meal at Ithaa Undersea restaurant, the world’s first all-glass undersea restaurant, will allow non-divers to experience the deep blue from a different angle. One of six other restaurants on the island, at Ithaa dine on, erm fish, as you admire shoals of tropical specimens swimming overhead. So start that Hilton HHonors account and get saving! Small but not cabin-fever inducing, secluded but sociable, upbeat but relaxing, romantic but family-friendly, glamorous but laid back, my hands-down favourite resort in the Maldives has to be Huvafen Fushi. 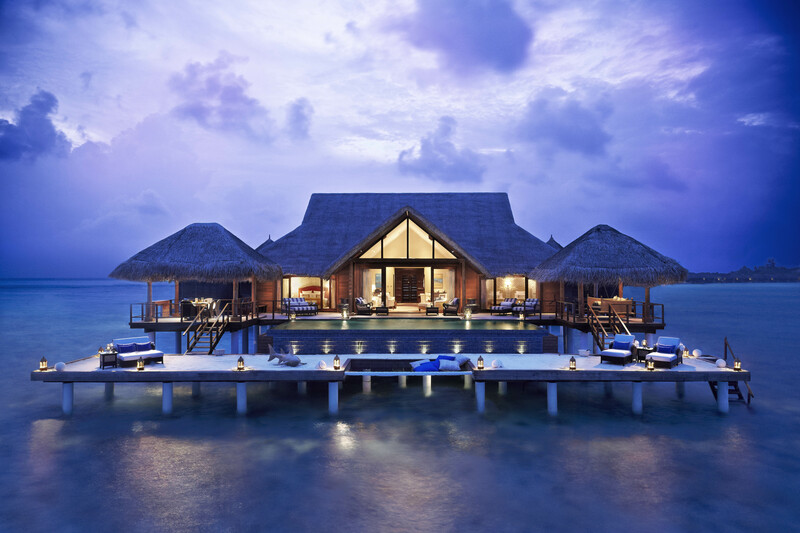 Boasting one of the best wine caves in the Maldives, underwater spa treatment rooms, glass-floored over-water villas with views of the sea floor and surely the sexiest infinity pool ever made, Huvafen Fushi is a resort like no other. 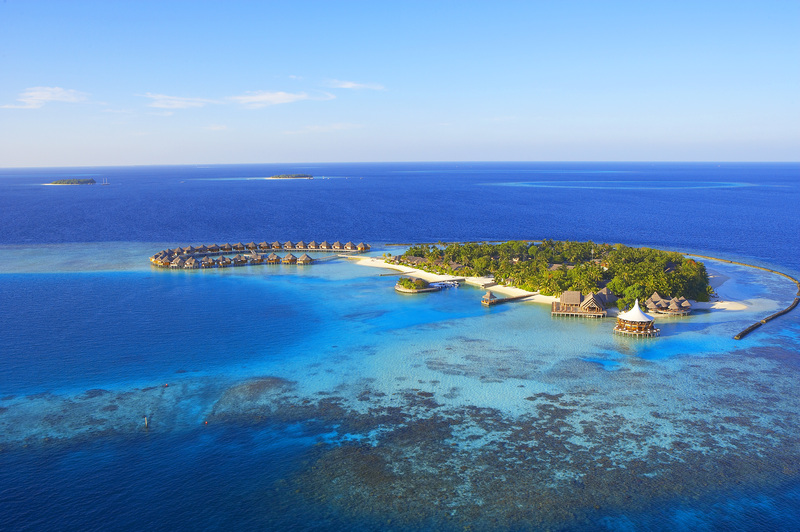 Attracting a smart, moneyed but not at all precious crowd, Huvafen Fushi manages to please stressed-out banker types, adrenalin-junkies, party girls, activity-hungry olders families and even the smug and sedated honeymooners. A narrow strip of white sand perfection, Huvafen Fushi is overrun with luscious palm-trees, an idyllic lagoon and one of the best house-reefs in the Maldives. So whatever the occasion, do yourselves a favour, and make sure to head straight to this one of a kind retreat. Since this article was written, a new show-stopper resort has opened its doors; Cheval Blanc Randheli. Already the new favourite of the rich and famous (including the Duke & Duchess of Cambridge), the resort was one of my top ten Jean-Michel Gathy designs. Have you been to the Maldives? Do you agree with my choices? I would love to hear about your favourite hotels and experiences. We are delilghted to have been included in your top ten and you can rest assured that when I walked past the pool today it was exactly as you have described. Thanks for your support. Thanks Julian – thanks for reading & great to hear that you liked the review and that we are in agreement on how fantastic the pool is! Hi Paul, thanks for your comment. If you liked Reethi Rah you must try Cheval Blanc Randheli, I think you’ll love it 🙂 Thanks for letting me know your thoughts on Baros, it’s really interesting to hear and very useful! Where are you off to next? Thank you for this blog Taj Exotica is the one I would stay in it looks stunning :), I like how you have given different options for different people, really interesting. 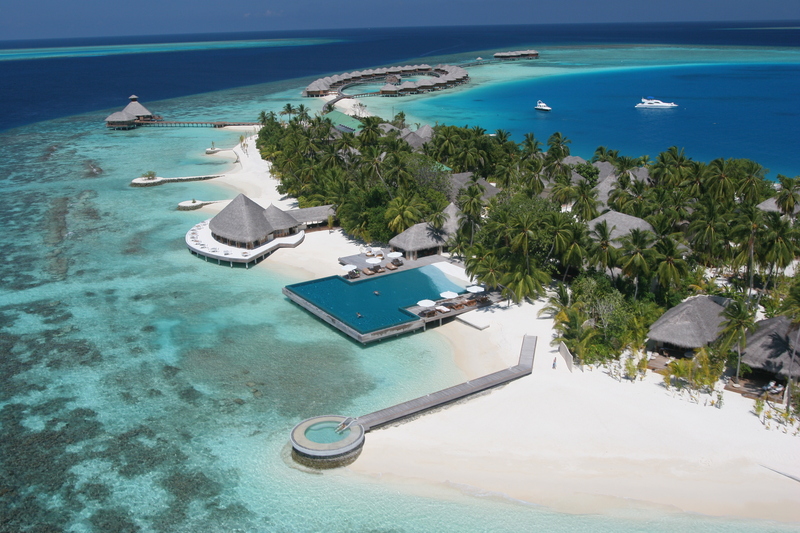 Please read my blog on the celebrities who have visited the Maldives, quite a list of people who love the luxury of the Maldives and the Spas http://goo.gl/dRbehb. Please contact me on my email if you want to talk about travel? Thanks for reading Louise! I agree, Taj Exotica is pretty awesome 🙂 Thanks for putting a link to your great blog post, I had no idea that Kate & Wills had visited Cheval Blanc recently! Hi The Tiny Traveller, thank you for reading 🙂 my blog, Kate and William are brilliant , they went in March for a well deserved rest. Fergie from the Black Eyed Peas went to number four on your top 10 :). I look forward to reading more of your awesome writing! Sorry for sending this comment twice :), computer problems. Hi The Tiny Traveller, Taj Exotica looks beautiful, but with those choice it is hard to pick, I like how you picked the best for each person :). Kate and Wills went in March, looks like a stunning place, they deserve a rest http://randheli.chevalblanc.com/en/. Fergie from Black Eyed Peas went to number four on your list 🙂 the One & Only Reethi Rah. Thank you for sharing this blog, look forward to reading more ! posts. After all I’ll be subscribing for your rss feed and I’m hoping you write again very soon!